The Trio Candy Vending Machine is very sharp looking, indestructible candy machine. It comes with 3 removable, shatter-proof, poly-carbonate canisters which can be set to vend a variety of small bulk candies or 1" balls. 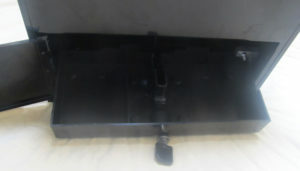 A spill tray is also provided to prevent messes. Being made of all mainly steel, it is built for extreme conditions. 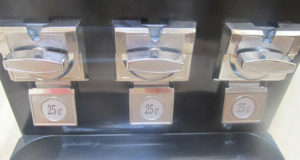 The coin mechs are metal, as well as the housing, lid, flap door, pole and base. 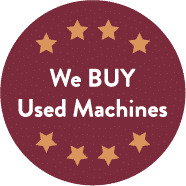 These machines are brand new, will ship directly from the manufacturer, and will include a full one year warranty on all the parts (excluding vandalism). A lifetime of technical support and assistance is also available to you as long as you own the vending machine. This purchase will include one complete machine. Each machine will come packaged ready to go with all the hardware, two keys, assembly instructions, and 25 cent pricing stickers. These machines have a few different options available to them, which you will choose when checking out below. 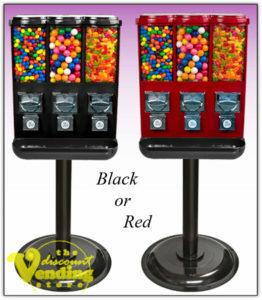 The standard machine purchase comes set so 2 canisters will vend small bulk candies like M&M's, Skittles or Mike & Ikes, and the third canister will vend 1" balls like gumballs or bouncy balls. If you prefer a different set-up, you may choose a different option when checking out below. Prices will vary depending on which selections are chosen. The Trio Candy Vending Machine is currently available in red or black only. Yellow is no longer available. The base and pole are all black. You can choose which color you prefer when checking out above. If you want to upgrade to 50 cent coin mechs, we could upgrade this for an additional cost as well. 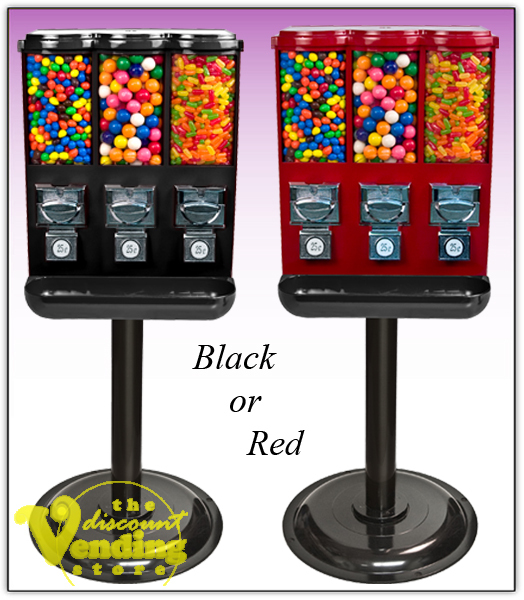 For our Candy/Gumball Vending Machines, we provide flat rate shipping to anywhere in the Continental United States via FedEx. Once your order has been placed, it will typically be shipped out within 3-4 business days, and be delivered approximately a week later. We will send you an email with tracking information so please provide a valid email address upon checkout.